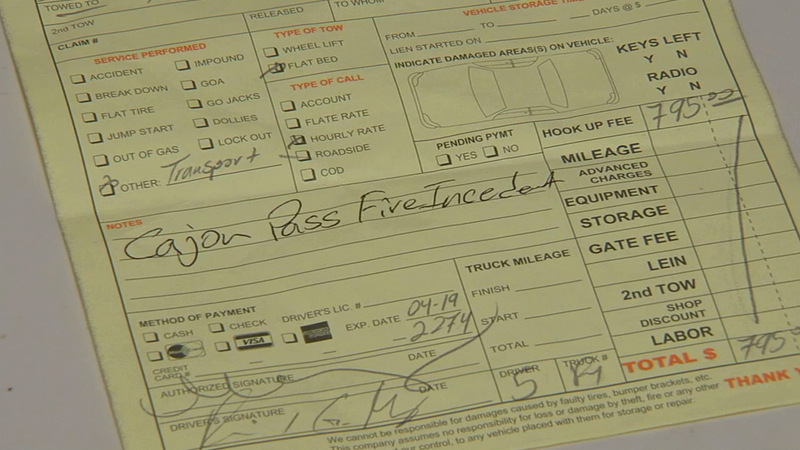 One of two receipts for towing Mariela Munoz's car is shown in this photo. HESPERIA, Calif. -- Some people who had to abandon their vehicles on the 15 Freeway and run from the North Fire were charged hundreds of dollars by towing companies that removed their vehicles from the scene. Mariela Munoz says Gonzalez Tow in Hesperia quoted her $1,321 Friday night. When she called, the company was about to close, so she was unable to get her car until Saturday. In the morning, the towing company quoted her a fee $300 higher than the quote the previous night. "They said, 'No, the fee was incorrect. The price is now $1,621 plus the gate fee, because it was the weekend,'" Munoz said. "They shouldn't be in business," she said. "You didn't tow my car because we did something illegally. You towed my car because it was an emergency and my family had to evacuate." Munoz was able to negotiate the price down to $1,095 and the company told her to call her insurance company to find out if it will cover the cost. Gonzalez Tow says California Highway Patrol requested the company's services and they charged normal hourly rates. Some of their drivers were working up to eight hours to help clear the freeway. A manager at Gonzalez Tow told Eyewitness News that the company plans to reimburse the fees for all nine people they towed. "Our company does not operate on people's hopelessness and any illegal activity or over charging," the manager said in a statement. "The hours we worked as a whole will be donated to the County of San Bernardino as good faith in helping to clear the highway." California Highway Patrol officials said they requested several tow companies from the Victorville area and do not control how much these companies charge.